Nineteen songs crammed onto one elpee, which makes Rundgren sound more like a creative crackpot than a musical genius. Kronomyth 4.0: Wizard Are You Bound? Something/Anything? was the work of a musical genius. A Wizard, A True Star is the work of a serial crackpot. Oh, there’s plenty of genius in evidence on AWATS: tantalizing teasers on the order of his last effort (“You Don’t Have To Camp Around,” “Does Anybody Love You?”) and fully realized songs that represent some of his most sophisticated music to date (“Zen Archer,” “Just One Victory”). You’ll just have to wade through some really weird stuff to get there, from one minute of noise (“Dogfight Giggle”) to ten minutes of oldies. If Todd’s goal was to sabotage the commercial success of Something/Anything? and distance himself from the singer/songwriter genre, mission accomplished. On AWATS, Todd emerges as a musical joker with an alternately dark and sentimental streak. The record also brings Todd’s fascination with the technical side of the creative process into the foreground. Unfortunately his brain is bigger than his soundboard, and the sophisticated arrangements that Todd has in his head are often clumsily captured in his homemade studio. As much as AWATS is commercial suicide, you have to admire the man for suffering for his art. Sure, you’ll suffer along with him as pearls are quickly dropped in favor of the next piece of flotsam, but not every day at the beach needs to be a day at the beach. 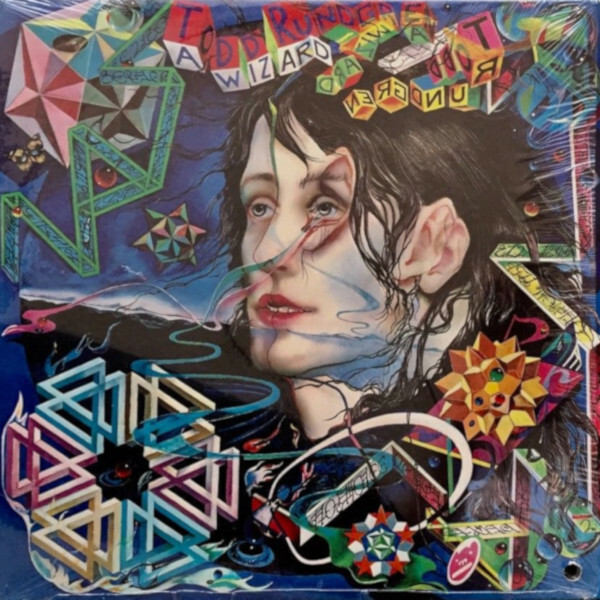 Love it or hate it, AWATS is no less the musical offspring of Todd Rundgren than his last record. In fact, it’s tempting to see this album, particularly the first side, as an abridged musical résumé. From this point forward, predicting Rundgren’s next move would be fool’s work as he flew between prog, pop, ballads and rockers, rarely resting at one long enough to build a base camp yet attracting loyal followers along the way. Todd Rundgren with Mike Brecker, Randy Brecker, Don Cosgrove, Rick Derringer, Buffalo Bill Gelber, Mark “Moogy” Klingman, Jean-Yves Labat, Barry Rogers, Dave Sanborn, Ralph Shuckett, John Siegler, John Siomos. Produced and arranged by You-Know-Who. Album design and photography by Janson, Eding, Chopper. Cover painting by Arthur Wood. Released on elpee on March 2, 1973 in the US (Bearsville, BR 2133) and the UK (Bearsville, K 45513) with gatefold cover and lyrics innersleeve; reached #86 on the US charts. US version features diecut cover. Re-issued on elpee and compact disc in 1987 in the US (Bearsville/Rhino, RNLP/RNCD 70864), the UK (Castle Classics, CLALP 134) and Germany (Bearsville/Rhino, 70864-2). Re-released on 20-bit K2 remastered compact disc on September 22, 1999 in Japan (Bearsville). Re-issued on K2 remastered compact disc on January 12, 2008 in Japan (Bearsvill,e VICP-63263). Re-released on super high material compact disc on March 18, 2009 in Japan (Bearsville, VICP-70061). Repackaged with Todd on expanded 2-for-1 2CD in 2011 in the UK (Edsel, EDSD 2123) with 3 bonus tracks. Re-released on super audio compact disc in 2018 in the US (Audio Spark, AS00044/5).